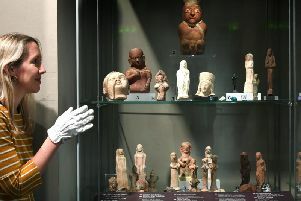 A new museum display in Leeds is bringing visitors face-to-face with ancient effigies created by cultures around the world across periods of human history. The new display case at Leeds City Museum includes almost 40 intricately carved statues and figures from civilisations including Ancient Egypt, Peru, Greece, Rome and Mexico and a tradition that started more than 40,000 years ago. A new display of faces and figures gone in the Ancient Worlds Gallery at Leeds City Museum, with figures which are more than 2,500 years old and they all depict people or faces from different cultures around the world. 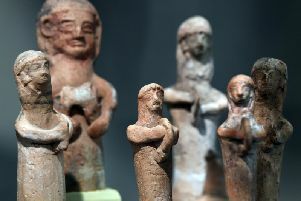 Among the pieces on display are a group of figurines recovered from a tomb in Cyprus depicting musicians playing tambourines and making offerings from around 700 BC, a Roman woman draped in cloth dating from around AD 50 and figures of Tanit, the goddess of Carthage and Pan, Greek god of nature and rustic music from 200-300 BC as well as a head of Bhudda from India. Figures on display at the museum. Faces from the Past can be found in Leeds City Museum’s Ancient Worlds Gallery, which is also home to a spectacular array of relics from ancient civilisations including the 3,000 year-old remains of Nesyamun an Egyptian mummy.